The Best Spotting Scope Reviews For 2019 - Our Top Picks! As a hunter, I remember how frustrating my hunting trips were before I discovered the awesome magnification power of the spotting scope. Introduced to be a solution to the binocular’s long range viewing inefficiency, the spotting scope is a must have for any serious hunter and enthusiastic birdwatcher. In this article, I will be introducing you to some of the best-rated spotting scopes. Also, I will give you some useful tips on how to select the best spotting scope. ​Back in the 1900s, when optical technology was still in its infancy, there was only a handful of spotting scope brands to choose from. Today, there are over 50 different spotting scope brands jostling for space in America’s billion dollars optical instrument market. And with every one of these 50 plus brands claiming to be the producer of the best spotting scope, identifying the best spotting scope can be a tall order for some. Nevertheless, there is no need to fret, for I have compiled a list of the best spotting scope reviews. I have selected these spotting scopes based on their features, price, ease of use, and overall performance in the field. It is my hope that you will learn something from these spotter scope reviews. 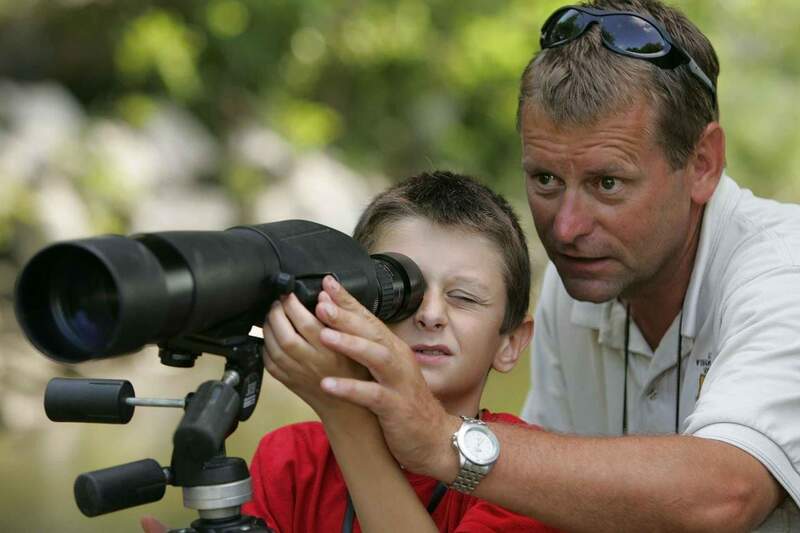 Spotting Scope Vs Binoculars : Which one is Best? 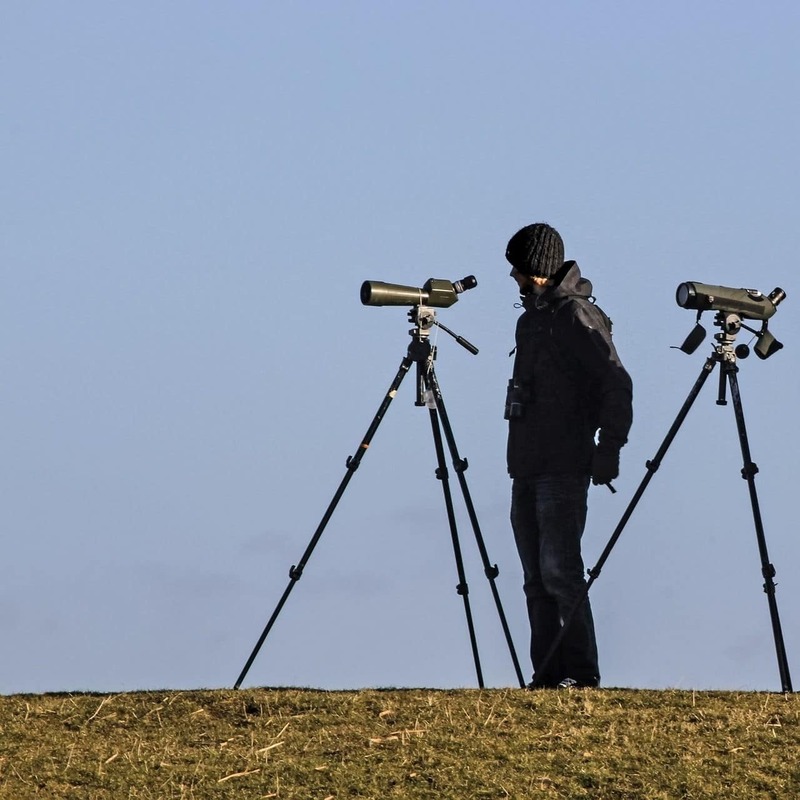 The debate on which optical instrument is better between a spotting scope and a pair of binoculars is one that is unlikely to end anytime soon. While the spotting scope has a higher magnification and a large objective lens the binocular has a better field of view. This raises the question of which instrument would win in a spotting scope vs binoculars fight. For some hunters, the spotting scope is the undisputed winner due to its long-range viewing capabilities. However, binoculars are still the preferred optical instruments for some hunters. The reason being those binoculars are more portable and less costly than spotting scopes. Compared to binoculars, spotting scopes are considerably costlier and are heavier. Thus, if you are looking for a flexible, portable and inexpensive optical instrument, go with the binoculars. Contrary if you want a more powerful instrument for long-range viewing of targets especially for long periods, the Spotting scope is the instrument for you. As you have probably already deduced from my very long list of spotting scope reviews, there are two major types of spotting scopes, angled body and straight body. By definition, a straight body scope is one that has an eyepiece that is parallel to the barrel. On the other hand, an angled body scope is one that has the eyepiece at a 45-degree angle to the barrel. Both categories of spotting scopes have pros and cons. Angled body scopes are easier to use when observing soaring or nestled birds. Also, these types of scopes can easily be used by a group of people of varying heights. Another benefit of using angled body scopes is that they require a shorter tripod. When compared to binoculars, the least expensive spotting scope is capable of providing you with better images than the costliest binocular. Thus, in a way you save on funds by purchasing a low-cost spotting scope instead of buying a pricey pair of binoculars. Ordinarily, spotting scopes weigh more than binoculars. However, there is a decent selection of lightweight scopes available out there. Most of these compact and lightweight scopes fall under the straight body category. If you carry heavy equipment, then it is important to consider how compact a scope is before purchasing it. While a scope with a high magnification is ideal for long range view, high magnification comes at the expense of image clarity and field of view. Thus, if you are in the market for an inexpensive or a mid-level scope, go with one with a low magnification. A magnification of 60X and above will cause the field of view to be diminished. Also, very few scopes can maintain image quality at a magnification of beyond 60X. Almost all spotting scopes feature a tripod mounting plate. The design of this plate will help you know how easy it is to use the scope. If you us prefer using your scope on a moving car, settle on a scope whose tripod plate is movable and can thus rotate the scope at different angles. Cost is another factor to consider. Ensure that the features of a scope match its price tag. Also, before settling on one, compare the quality and price of different models. If you are an avid hunter like me, then you know the importance of investing in a good spotting scope. So what is the best spotting scope for hunting? This is a question you have probably asked yourself. Though there is no precise answer to such a question, here are three spotting scope reviews for hunting that might help you find a suitable answer to your query. The Regal M2 100ED features the same high-quality objective lens as all the other scopes in the M2 series. As its name suggests the Regal M2 100ED’s objective lens is crafted from a special type of glass known as extra low Dispersion glass or ED glass for short. This glass limits the scattering of light as it passes through the objective lens. This results in sharp, clear images and reduced color distortions. Amazingly, the Regal M2’s objective lens has a diameter of 100 mm and thus possesses better light gathering capabilities than 65 mm or 80 mm objective lenses. To enhance brightness, all lenses on this spotting scope coated with Celestron’s proprietary XLT coating. Regarding its performance, I found it to be a great performer, especially for long-range observations. This is because the 100ED M2 model boasts of a 22 to 67X magnification, which is ideal for intermediate to long-range scoping. To make things even better, Celestron offers this model with a 20 mm eye relief and adjustable rubber eye-cup. As per my observations, the Regal 100ED is the best spotting scope for elk hunting. All these components housed inside a durable magnesium alloy body. For enhanced performance in low visibility, the housing filled with nitrogen. From its features, it is evident that the Regal M2 100ED is one of the best spotting scopes for hunting. Bushnell’s motto has always been to provide high quality, reliable and affordable optical instruments, and this exactly what you get with the Bushnell Trophy XLT 20-60x 65mm Scope. With some of the most impressive features I have seen on an inexpensive scope, the Trophy XLT is rugged and bright. The zoom magnification on this scope ranges from 20X all the way up to 60X. It is hard to ascertain Bushnell’s claims that the Trophy XLT’s 65 mm objective lens gathers over 17% more light than the standard 60 mm lens. Nevertheless, I found it performed better than most 60 mm scopes I have used. Amazingly, the Regal M2’s objective lens has a diameter of 100 mm and thus possesses better light gathering capabilities than 65 mm or 80 mm objective lenses. To enhance brightness, all lenses on this spotting scope are coated with Celestron’s proprietary XLT coating. Bushnell opted for its proven Porro Prism design and fully multicoated optics. As such, you get stunning, clear and ultra-bright images. As one of the top rated spotting scopes for hunting, the Bushnell Trophy XLT has a rubberized armour that makes it 100% waterproof. Accompanying each and every Bushnell Trophy sold are soft and hard side carrying cases as well as a compact tripod. When you consider all the features and accompanying accessories you are getting with this scope; its price tag is quite a bargain. The Celestron 52306 Regal’s closest competitor is the Vanguard Endeavor HD 82A. And it is a great alternative to the pricier Celestron. Boasting almost the same features as the Celestron 52306 Regal, this Vanguard model has proven to be a worthy investment. Though the Endeavor HD’s 82 mm objective lens is significantly smaller compared to the Celestron’s 100 mm lens, it is still far much better than the standard 60 mm and 80 mm lenses. As for its magnification, the Endeavor has a magnification range of between 20X and 60X. Since the Vanguard’s 82 mm lens is made from the same ED glass found on the Celestron, they are evenly matched in regards to image clarity and brightness. Similar to the Celestron, the Vanguard has an angled design that allows for a better upward view. Also, thanks to its 45 degree angle design you do not have to be at eye level height to comfortably view a target using the Vanguard HD 82A. The Vanguard is compatible with almost all standard tripods thanks to its mounting plate. Measuring 6.5 cm in length and 3.8 cm in width, this plate is equipped with grooves that give it stability. The mounting plate connected to the scope’s barrel by a collar that encircles the entire barrel. The collar is easy to loosen using a small level located on the right hand. Since the collar can be loosened you can rotate the entire unit easily. Since the Vanguard Endeavor is one of the top rated spotting scopes for hunting, it is both waterproof and fog proof. Moreover, this Vanguard scope has a built in sun shield and constructed from a lightweight Magnesium alloy. If you are a serious hunter and wants to know which are best binoculars then you can consider my other posts too. When I am not hunting I like to go for target shooting, I find this to be the best way of perfecting my skills. One instrument I never leave behind is my trusted spotting scope. Thus, apart from perfecting my skills, target shooting presents me with an opportunity to experiment with different scopes. Based on my experiences and observations, here are three of the best spotting scope for target shooting reviews. The Vortex Viper HD Spotting Scope is a target spotting scopes built for long-range viewing. And although it is not the most affordable target spotting scope out there it is one of the best spotting scopes for target shooting. Thus if you have been wondering what is the best spotting scope for target shooting, the Vortex Viper is one of the best. To justify it's relatively hefty asking price, Vortex equipped this spotting scope with a 65 mm objective lens manufactured using extra low dispersion glass. As we have already seen, this type of glass enhances contrast, resolution, and color. As for magnification, the Vortex Viper has a minimum magnification of 15X and a maximum of 45X. The benefit of this magnification is that you get a better field of view and image clarity at all magnifications. One of the most appealing things about the Vortex Viper HD is its angular design. If you find adjusting the tripod height of your spotting scope to be annoying this design is one you will love. The angular design of this scope makes using this scope in an upward angle easy. While the Viper’s angular design makes it easy to use, its Porro prism design provides exceptional image quality. All the lenses being coated with an Amortek Lens coating to protect them from dust, water, oils etc. Though it might not be the best spotting scope for elk hunting, the vortex viper is quite easy to use. I was pleased with its eye relief and adjustable eyecup, which twists up and down. On the other hand, its intuitive tripod mount, which is directly mounted to the barrel using a circular collar, makes the viper easy to rotate while in the field. Personally, I have never used this scope on a moving car; however, based on some of the reviews I read online, it offers exceptional stability for use on a moving car. Weighing 53 ounces and fashioned from a lightweight magnesium alloy, the Vortex Viper HD is a an excellent spotting scope for target shooting. As a testament to its status as one of the best target spotting scopes, Vortex offers an unconditional lifetime warranty on this spotting scope. One of the best target spotting scopes I have had the delightful pleasure of using is the Redfield Rampage 20-60x60mm Spotting Scope. Interestingly, this Redfield offers a higher magnification than some of its pricier counterparts. Weighing a meager 5.1 pounds, the Redfield Rampage comes with a magnification of 20X to 60X. One of the many things I love about this Redfield model is its 60 mm objective lens, which can focus on things as close as 19.8 feet. All the lenses in this pocket-friendly spotting scope are fully multi-coated while the prisms made from high quality Bak-4 glass. Thanks to all these optical features, the Redfield provides unrivaled light transmission, image clarity, and brightness. Thus, there is no time of day you can’t use it. The Redfield Rampage is constructed from lightweight materials; hence it weighs a meager 37 ounces. To be more specific, this Redfield model crafted from the same material used to make bulletproof glass. Thus, in addition to being lightweight, it is also durable and rugged. Included in the package are a standard tripod and a soft storage case. While it does come with a tripod, this Redfield model is also compatible with most standard tripods. Unlike other spotting scopes in Celestron’s M2 line of scopes, the Celestron 52312 has a magnification of 27X and can focus on things as close as 21.3 feet. The light gathering capabilities of this spotting scope are impressive, thanks to its 80 mm objective lens. Which is a far much better lens than the standard 60 or 65 mm objective lenses that feature in most mid-level and budget scopes. As an angled eye-piece, this Celestron model is versatile and easy to use. The focus knob turns smoothly and the eye relief is not too bad either. The extra low dispersion glass used to make the 80 mm objective lens reduces light distortions and improves image clarity and brightness. As a bonus, Celestrons coats the lens and optics of this scope with a proprietary XLT coating for improved performance. The prisms are made from high-quality Bak-4 glass and the optics are all fully multi-coated. When you purchase the Celestron 52312 spotting scope you get a stay-on case and an objective lens cap. Also included in the package is an eyepiece cover, a lens cloth and a T adapter ring. The Celestron weighs a meager 3.5 pounds thanks to its lightweight magnesium alloy construction. The scope comes with a stay-on case that protects it’s from knocks and falls. Thus, in terms of durability, the Celestron is fairly durable and is unlikely to get damaged by falls and knocks. Topping the list is the American BARSKA Colorado Waterproof Spotting Scope. A versatile spotting scope, the BARSKA Colorado can withstand most weather conditions. Therefore, it also doubles up as a good spotting scope for hunting. The 60 mm objective lens of this spotting scope offers a decent field of view and clear images in low light. For magnification, you get a 20X to 60 X magnification, which is ideal for long range viewing. Unlike other inexpensive spotting scopes for birding, the BARSKA Colorado comes with a tripod included in the package. Given the scope’s price tag, you might be forgiven for thinking that the tripod is not well-made. However contrary to this, the tripod is well-made and sturdy and it can be adjusted to accommodate different viewing positions. Probably the best birding spotting scope I have ever used, the Celestron 52250 is an inexpensive scope with a large objective lens and a sleek design. An 80 mm diameter objective lens with an anti-reflective coating covering it delivers brilliant image clarity and light transmission. The same coating found on the objective lens is the same found on the spotting scope’s zoom eyepiece. Inside this eyepiece is a zoom lens that can magnify from 20X to 60 X.
I have always been a fan of angled eyepieces. Thus, one of the main reasons why this is one of my best spotting scopes for birding is its 45 degrees angled eyepiece. The smooth focus and zoom knobs add to this Celestron’s ease of use. And although the multi-coated optics are not fully coated, they do provide a decent image quality at low visibility. At the bottom of the Celestron 5225, you will find a tripod socket that is compatible with most standard tripods. Also, this scope can be connected to a camera using the DSLR adapter, which comes separately. I had no problems using this scope in the great outdoors, thanks to its rugged and sturdy rubberized armor. The soft carrying case is not that bad, considering this scope’s price tag. The ALPEN Spotting Scope is one that cannot compare to other scopes in its price range. This is because, apart from being one of the best spotting scopes for birding, the ALPEN is also packaged in a foam filled aluminum case. An 80 mm objective lens provides excellent light transmission, while the 20X to 60X zoom lens gives this scope its awesome magnification power. One of the amazing things about this scope is that image clarity remains the same even when zoomed to the maximum 60X magnification. Though I am not an avid user of Alpen scopes, I was impressed by this scope’s performance. Equipped with high-quality Bak-4 prisms and fully multicoated optics, this scope is one of the best spotting scopes birding. As you have probably already guessed I love angular designed spotting scopes. Hence, the angular design is one of the things that attracted me to this scope. Sealed optics and a rubber construction mean that this Alpen scope is waterproof and fog proof and can thus withstand the vulgarities of weather. A nylon carrying case included for helping you transport your instrument from one place to another. Not all scopes are designed for use on a tripod as some are compact enough for use with just one hand. These compact spotting scopes are designed for hunters who are always on the move. Below are two compact spotting scope reviews to help you select the best compact spotting scope for hunting. Since 1903, Carl Zeiss has been manufacturing top of the line optical instruments. One of the company’s recent additions to its impressive portfolio of optical instruments is the Carl Zeiss Optical Dialyt Field Spotter 18-45x 65 Spotting scope. In regards to performance, I must admit, I found it extremely easy to use, especially since I could operate it with one hand. Though its field of view is not the best, this Carl Zeiss compact model boasts of multi-coated optics that deliver bright and clear images. Weighing a meager 42 ounces, the Optical Dialyt weighs less than most of its competitors. Also, it is easy to carry either in your pocket or backpack. In addition to being lightweight, this scope comes with a lifetime transferable warranty. The best compact spotting scopes need to be as durable as they are compact. In this regard, the Optical Dialyt has a tough rubberized armor that protects it from harsh weather conditions. One of the best compact spotting scopes from Vortex is the Optics Diamond Scope. Designed for use in rough terrains, this scope has all the features that a great compact spotting scope ought to have. Measuring 14 inches in length, the Optics Diamondback comes with a 60 mm objective lens and a magnification of 20X to 60X. In essence, the Diamondback offers the same light gathering capabilities of a standard scope in a lightweight and compact package. Unlike the Optical Dialyt, the Diamondback features a Porro prism design. The prisms are multi-coated for optimal brightness, and color accuracy. The lenses, on the other hand, have XR coatings that improve light transmission and brightness. Thanks to its lightweight and compact design, this spotting scope is easy to use. Moreover, I found that it has a good eye relief and can accommodate glass wearers. The entire unit covered with a rubberized armor that makes it 100% water proof and fog proof. Also, all lenses have an Amorttek coating that protects them from oils, scratches and dirt. When you want the best scope that the spotting scope market has to offer, you have to be ready and willing to spend some serious cash. Also, you have to invest in a scope that matches its hefty price tag. So if you are in search of the best spotting scopes for the money here are three high-end spotting scopes that will knock-your-socks-off. In my opinion, the highest rated Vortex spotting scope is the Vortex Optics Razor Spotting Scope. This awesomely impressive scope made its debut in mid-2009 and is the fantasy scope for many. Given its hefty asking price, much is to be expected from the Optics Razor HD. Thus, although its 18X to 48X magnification is standard it maintains high image quality and clarity at all magnifications. The eyepiece is backed by a 65 mm objective lens. Do not be fooled by its hefty price tag, the Vortex Optics Razor is quite an easy instrument to use. In terms of weight, this scope is quite compact as it weighs 7.2 pounds. The first thing you notice about the Vortex is its appealing angular design. However, while its good looks earn it a spot on the list of the best value spotting scopes, is its rugged construction that makes it a sure winner. When you buy this scope do not expect to buy a new scope anytime soon. Another spotting scope from Celestron’s line of M2 spotting scopes that is worth its price tag is the Celestron 52304 Regal M2 65ED Spotting Scope. Though the Regal M2 costs less than its competitor the Optics Razor HD, it can more than hold its own against its pricier counterpart. For starters, the 52304’s objective lens is manufactured using high-quality ED glass that enhances contrast, resolution, and color. To make things more enticing the 52304 model comes in three varying objective lens sizes. The sizes are 65 mm, 80 mm and 100mm. When it comes to performance, the Celestron 52304 is right up there with the best. As such, the 52304’s objective lens is made from the same high-quality ED glass found on all its M2 siblings. Fully multi-coated optics and lenses provide minimal light distortion, image clarity, and accuracy at long distances. The least costly variant of the Regal M2 65ED offers a magnification of 16X to 48X. This magnification combined with the scope’s 65 mm objective lens provides a great field of view and consistent image quality. As a mid-level spotting scope, the construction of this scope is top notch. Similar to all other M2 models, the Regal M2 65ED is constructed from a magnesium alloy. Therefore, this scope is both lightweight and rugged. In fact, Celestron claims that it weighs 14% lighter than most of its siblings. The costliest spotting scope in my arsenal of scopes is the Diascope Angled 85mm Spotting Scope from legendary spotting scope maker Carl Zeiss. I had to part with quite a substantial sum of money to acquire this prized scope and in all honesty, it was worth every penny and here is why. By far the best spotter scope for the money from Carl Zeiss, the Diascope Angled scope features an amazingly wide field zoom eye piece. Boasting of a 20X to 75X magnification, the eye piece is perfect for long range viewing. Of the many spotting scopes, I have used none can match the Diascope’s performance. Carl Zeiss went all out when designing and crafting this optical masterpiece. As such, expect razor sharp images, exceptional brightness, and consistency in performance. Carl Zeiss used an innovative and high-quality glass in the making of the Diascope’s 85 mm objective lens. To ensure that the scope is able to pinpoint the finest of details, all lenses are coated with a revolutionary coating known as the Lutotech coating. One of the scope’s thrilling features is its eyepiece. The latter can easily be removed by the turn of a button. However, accidental release of the eyepiece is not possible. The housing is made from lightweight materials and encased within a rubberized armor for optimal protection. The little-known spotting scope manufacturer, Konus, is behind the production of one of my all-time favorite spotting scopes, the Konus 7122 20x-60x100mm Spotting Scope. Sold together with a carrying case and a camera adapter, this Konus scope is quite the spotter. As it is already evident from its title, the Konus 7122 has an impressive magnification of 20X to 60X. With this magnification, you get phenomenal image clarity and resolution. The brightness of this scope is enhanced by its extraordinarily large 100 mm objective lens. One of the first things I realized about this scope is that it is quite heavy. Hence it is not ideal for on-the-go hunters. Nonetheless, it does score high points in other areas, for example in performance. Speaking of performance, the focus and zoom wheels turn effortlessly while the porro design prisms are crafted from high-grade Bak-4 glass. Sadly, the optics on this scope are not fully coated. However, they do have sufficient coating to deliver enhanced brightness and image clarity. As I have already stated, the Konus 7122 might be one of the best spotting scopes on a budget, but it is not the lightest. It weighs 5.3 pounds and measures 18.8 inches in length. Thus to use this scope you will most likely require a stable tripod. Fortunately, its tripod plate is compatible with most standard tripods. Furthermore, it comes with its own tripod. The reason why this scope is bulky is that it is made from pure metal. And since metal rusts when exposed to humid weather, its metallic housing is wrapped in a rubber armour. Thus, similar to all other scopes on this list, the Konus is waterproof and fog proof. The Celestron 52250 80mm Spotting Scope is one of the best cheap spotting scopes from the California-based manufacturer. Accompanied by a soft carrying case, the Celestron 52250 qualifies to be a good cheap spotting scope. It is hard to believe that the 52250 model is categorized as an inexpensive scope, especially since it comes with a large 80 mm objective lens and a magnification of 20X to 60X. And although image quality takes a nose dive when you zoom past the 25X mark, it is still a worthy investment for any hunter. The zoom eyepiece that is responsible for the scope’s zoom can be turned using a zoom wheel, which turns smoothly. I have used this scope in low visibility conditions several times and it has never disappointed me. The optics are multi-coated for a bright and clear target viewing experience. Apart from having an easy to turn zoom wheel, the 52250 also has a decent eye relief and can accommodate both glass wearers and non-glass wearing users. For close focus, this scope can focus on things as close as 26.2 feet. With a DSLR camera adapter and a tripod socket, the Celestron 52250 is compatible with DSLR cameras and most standard tripods. As for its construction, this model is covered with a rubber material that protects it from falls and knocks as well as from harsh weather. For starters, you get a decent 60 mm objective lens and a magnification of 20X to 60X. Given that it goes for less than $ 100, the image quality takes a dip when you get to the 40X mark. Nevertheless, this is a far better compromise than other scopes. Although it has a sophisticated design, it is pretty easy to use. The zoom wheel is conveniently located on the eyepiece. And both it and the focus wheel are easy to turn but have enough resistance to prevent accidental turns. As with most standard scopes, the Firefield is fitted with Porro prisms made using superior Bak-4 glass. To enhance their performance all optics and lenses are fully multi-coated. To give you a non-slip grip, the Firefield spotting scope has a rubber armor covering its body. Apart from improving grip, this rubber armor protects the scope from weather extremities. Who said you have to spend more than $200 on a spotting scope. While the best spotting scopes cost $200 and above, there is a big selection of great scopes that cost less than $200. So let us take a look at two of the best spotting scopes under $200. When you think about a spotting scope under $200 you are probably thinking of cheap and poorly constructed knock-offs that are not worth your time. Well, that’s the exact opposite of what you get with the Barska Blackhawk Spotting Scope. The Barska Blackhawk is a versatile scope with a 60 mm objective lens and a 20X to 60X magnification. This means you get the same image quality and light transmission as you would expect from other costlier spotting scopes. The performance of this inexpensive instrument is astonishing. The multi-coated optics combines with the large objective lens to deliver sharp and crisp images. The fun does not end there, though, as the Blackhawk has an ergonomic design, making it easy to use in the field. The eyepiece is easy to zoom in and out. Yes, for less than $100 you get a high quality hard aluminum case to go with your Barska Blackhawk. As if that is not enticing enough, Barska throws in a sturdy tripod on which you can mount your Blackhawk. The entire unit is covered in a rubber exterior. This rubber cover protects the inner components from damage and water intrusion. Thus, the scope is waterproof. The beautifully designed Tasco spotting scope is a little bit costlier than the Barska Blackhawk. However, this world class scope is still quite a bargain, when you consider its impressive list of features. Since the Tasco costs approximately $ 60 more than the Blackhawk, it comes with a larger 80 mm objective lens. However, it maintains the standard 20X to 60X magnification. One of the things that attracted me to this scope is its 45 degrees angled eyepiece that makes it easy to use on short tripods. Equipped with a focus knob and zoom knob, the Tasco has an impressive range. I have used it to spot targets as far as 400 yards away. All images appear bright and clear thanks to the multi-coated optics and large objective lens. Ordinarily, you do not expect to get many accessories with a spotting scope under $ 200. This is why I was impressed with the tripod and aluminum carrying case that comes with the scope. Also included in the package is a fabric case. Mounting this scope onto a tripod is done using a tripod mount that is compatible with most standard tripods. In foggy weather, you get clear images courtesy of the nitrogen filled barrel of the scope. The exterior of the scope is water proof thanks to its rubberized armour. If you are in the mood of spending over $200 on a spotting scope but do not want to go beyond the $500 mark, below are the two scopes that should top your list of options. To ensure that it is able to compete in the competitive spotting scope market, Vortex fitted this scope with an impressive 80 mm objective lens and a 20X to 60X magnification zoom lens. The large objective lens has awesome light gathering capabilities. Although it is a compact scope that weighs 2.9 pounds, the 80S1 offers outstanding performance. At the core of its performance are the XR coated optics and anti-reflective coated lenses that increase light transmission. The Porro Prism design offers excellent image quality while the adjustable eye cup makes it comfortable to use. The prisms are also coated and thus guarantee clear and bright images. The barrel of the Diamondback Scope is filled with nitrogen to prevent it from becoming foggy. The lenses are coated with an ArmorTek coating that protects them from all kinds of dirt and oils. To protect it from the harshness of weather, the Optics DBK is wrapped in a rubber armor. The Endeavor HD 85A’s smaller brother the Endeavor HD 65A is compact and inexpensive. While it does not cost as much as its older brother, the 65A is quite an impressive spotting scope. Its sleek lines give it a premium look. The 65 mm objective lens on this Endeavor model delivers accurate color rendition and is almost void of color fringing. The secret to its high-quality images is its objective lens that is made from extra-low dispersion glass and its 15X to 45X magnification zoom lens. The angled design adds to its appeal while its detachable eyepiece makes it easier to use. Vanguard opted for a high-quality Bak-4 glass in the construction of the HD 65A’s Porro prism and a dual focus wheel. Using this spotting scope was a breeze and it could focus on far away targets without losing stability. The optics are all fully multi-coated and so are the lenses. In addition to coating, Vanguard also equips this scope with a sun shield that eliminates glare. As for its construction, the Endeavor HD 65 A is covered by a waterproof rubber material and is thus almost impervious to damage even in the harshest of conditions. For added protection, you also get a cloth cover that stays on when in use. One of the best spotting scopes under $1000 is the Vortex Optics Viper HD. Equipped with various awesome components; this scope is one of my favorite. Here is my honest review of the Vortex Optics HD. To justify its hefty price tag, Vortex uses extra-low dispersion glass to make the scope’s 80 mm objective lens. Thanks to this technology the Optics Viper delivers high definition images void of color distortions. Additionally, it can zoom from 20X to 60X. The performance of this scope is guaranteed by its fully multi-coated optics and adjustable eye cup. While the coated optics delivers high-quality images the adjustable eyecup makes it easy to use. In order to prevent any dirt or dust from entering the interior of the barrel, Vortex designed this scope with O-ring seals. An eyepiece cup is fitted to the eyepiece to protect it from external contaminants. The same protection is afforded to the objective lens, which has a lens cover. For carrying your scope, you are bequeathed with a custom fitted case. This green colored spotting scope is crafted from high quality materials and is covered by a tough rubber exterior. In case of anything, you can always take advantage of vortex’s unconditional lifetime warranty. Truth be told, $1000 and above is a lot of money to spend on a spotting scope. However, there are some spotting scopes whose performances are totally worth $1000. One such spotting scope is the Vortex 20-60x85 Spotting Scope. At a cost of over $1,000, the Vortex Razor HD has all the features required for an everyday hunt and more. It has an angular design, which is perfect if you want a scope for watching birds perched on high ground or for scoping an area from an angled position. During the day I use the Vortex for the occasional bird watching and at night I enjoy viewing far away planets such as Jupiter, which are visible at night. In this regard, the 85 mm objective lens of the Razor HD is so good that it can be used for astronomy related purposes. The scope’s amazing light gathering capabilities are complemented by its 20X to 60X magnification. I am always impressed by how clear the Vortex Razor HD is, I guess it’s why it’s called Razor HD. The objective lens is made from high-grade ED glass and all the lenses are AmorTek coated. And so are the prisms, but with a different kind of coating. Conveniently located near the eyepiece, the Zoom wheel turns smoothly. Everything about this spotting scope exudes high-quality construction and craftsmanship, from the angular design to the standard tripod mount. And although it is quite bulky, the Razor HD scope has well-protected optics and can be mounted on most tripods. It would have been an insult for Vortex to use low-quality materials in the construction of this scope, right? Well, Vortex uses only high-quality materials and wraps it with a hard rubber armor. In terms of weight, the entire unit weighs 4.1 pounds. Although some of the spotting scopes I have reviewed above might be out of your financial reach, I am sure there is quite a number of them that are right up your financial allay. That being said, it is my hope that this list has given you an idea of the kind of scope to buy. So if you are in search of your next scope, why not buy one of these ones.